MILLER, George, a Representative from California; born in Richmond, Contra Costa County, Calif., May 17, 1945; A.A., Diablo Valley College, Pleasant Hill, Calif., 1965; A.B., San Francisco State University, San Francisco, Calif., 1968; J.D., University of California Law School, Davis, Calif., 1972; lawyer, private practice; staff, California state senate majority leader, 1969-1974; elected as a Democrat to the Ninety-fourth and to the nineteen succeeding Congresses (January 3, 1975-January 3, 2015); was not a candidate for reelection to the One Hundred Fourteenth Congress in 2014; chair, Select Committee on Children, Youth, and Families (Ninety-eighth through One Hundred First Congresses); chair, Committee on Natural Resources (One Hundred Second and One Hundred Third Congresses); chair, Committee on Education and Labor (One Hundred Tenth and One Hundred Eleventh Congresses). Papers: 1975-2014, 268 linear feet. The papers of George Miller include correspondence, voting records, subject and issue files, press releases and newspaper clippings, a small amount of photographs, and audio and visual materials. Oral History: In the Rosie the Riveter World War II Home Front Oral History Project, 2010, 15 pages. 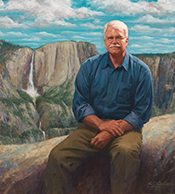 An oral history interview was conducted with Congressman George Miller by Javier Arbona on August 13, 2010. In the interview, George Miller discusses the following: the Port Chicago explosion and of rediscovering the incident; Navy mutiny trial; trajectory through Congress of Port Chicago memorial and Freddie Meeks’ pardon; discussion of mutiny trial review; partial recollections of dealing with the Clinton White House; on meeting Freddie Meeks and giving visibility to the African American story; discussion of Port Chicago town condemnation; open-ended discussion of long-term plans for Port Chicago area; reflections on the role of race in American memory and World War II lessons; and framing Port Chicago in a personal perspective. Videotape: 1990, 1 videocassette. Child care from the perspective of a Congressman [videorecording]: interview with George Miller by Gayle Kimball on August 1, 1990. Miller, George, ed. Giving Children a Chance: The Case for More Effective National Policies. Washington: Center for National Policy Press, c1989.